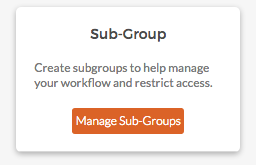 Sub-Groups allow you to segment Projects and Data and give access to those Sub-Groups to different users. The SubGroup Creation is an add-on. email support@hapyak.com for access. Go to Group Settings / Admin. On the bottom left, click "Create Sub-Group"
Enter the name of the Sub-Group and click "Create" (note that it may take a few seconds to create the Sub-Group. You'll now see the Sub-Group appear in your Group List.